Valproic acid (VPA) is considered first-line drug in treatment of generalized idiopathic seizures such as absence, generalized tonic-clonic and myoclonic seizures. Among major antiepileptic drugs, VPA is also considered effective in childhood epilepsies and infantile spasms. Due to its broad activity, VPA acts as a mood stabilizer in bipolar disorder and it is useful in migraine prophylaxis. Despite its long-standing usage, severe reactions to VPA, such as liver toxicity and teratogenicity, are reported. 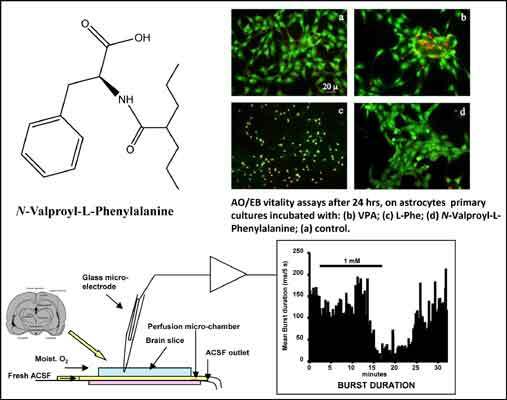 To circumvent side effects due to structural characteristics of VPA, we synthesized in good yield a new VPA-aminoacid conjugate, the N-valproyl-L-Phenylalanine, and characterized by FT-IR, MS, 13C and 1H- NMR analyses. The Log DpH7.4 value (0.19) indicated that new molecule was potentially able to cross biological membranes. The resistance to chemical and enzymatic hydrolysis of N-valproyl-L-phenylalanine was also assessed. All trials suggested that the compound, at the pH conditions of the entire gastro-intestinal tract, remained unmodified. Furthermore, the new compound did not undergo enzymatic cleavage both in plasma and in cerebral medium up to 24 h.
The toxicity assay on primary cultures of astrocytes indicated that the synthetized conjugate was less toxic than both free VPA and L-Phenylalanine. In this paper, the anticonvulsant activity of the new compound against epileptic burst discharges evoked in vitro in rat hippocampal slices was also evaluated. These preliminary results underline that N-valproyl-L-phenylalanine as new potential antiepileptic agent could represent a good candidate to further investigations. Aminoacidic derivative, astrocytes toxicity, CNS-targeting, enzymatic stability, hippocampal epilepsy, valproic acid. Dipartimento di Scienze e Tecnologie Biologiche Chimiche e Farmaceutiche (STEBICEF), Università degli Studi di Palermo, Via Archirafi 32-90123, Palermo, Italy.